I know, I know — you never believed this day would come. And who could blame you? Nearly thirteen years after my 2005 SVPCA talkSweet Seventy-Five and Never Been Kissed, I am finally kicking the Archbishop descriptive work into gear. And I’m doing it in the open! In the past, I’ve written my academic works in LibreOffice, submitted them for peer-review, and only allowed the world to see them after they’ve been revised, accepted and published. More recently, I’ve been using preprints to make my submitted drafts public before peer review. But there’s no compelling reason not to go more open than that, so I’ll be writing this paper out in the open, in a public GitHub repository than anyone can access. That also means anyone can file issues if they thing there’s something wrong or missing, and anyone can submit pull-requests if they have a correction to contribute. I’ll be writing this paper in GitHub Flavoured Markdown so that it displays correctly right in the browser, and so that patches can be supported. That will make tables a bit more cumbersome, but it should be manageable. Not directly about your Archbishop work, but generally about open access. I think I e-mailed you a while back about a study of the effects on science (as measured by citations) of making research more readily available, using an American WW II program of reprinting more cheaply German scientific works that had been extremely expensive because of copyright. I think in the end we just gave up on even listing it in the Palaeo Project Challenge. And then more recently there was this. What’s happened in the last few years is that I’ve got a ton of papers mired in the depressing swamp of peer-review — three papers at PeerJ that have been reviewed and await my revisions, one of which has been in that state for two and a half years. I find this process too awful to plough through, but the fact that it’s hanging over me means I don’t feel free to work on the new stuff that’s actually exciting me. It’s a lose-lose. In the end, sometime you just have to go “screw it, I’m going to do some work that I care about”. Why was it name the Archbishop? Sounds like there’s a story behind this. You know, you’d think there would be a story behind the name. But there isn’t. Here is its genesis, in a fourteen-year-old email, with irrelevant parts redacted. Hey, I spent almost six months doing that with Sauroposeidon. I think it builds character and helps you bond with the animal. Good start. Sketching what you don’t see is a terrible waste of time, if only because there’s so much more to draw. In this case, I think everyone on the planet other than you, me, and Jack McIntosh has forgotten that the BMNH Tendaguru material exists. Possibly with good reason, since I haven’t ever seen this material and I’m not certain how much they have or what shape it’s in. But in any case, you should have free reign. Hmm, honestly, I had no idea how inappropriate that would sound until I wrote it. Now I’m all out of sorts and I’m afraid I’ll be no more help on this score today. LMAO! Thanks for sharing the story. At least you didn’t drunk name a dinosaur Mojoceratops. Heard the paleontologists were intoxicated when they named it. 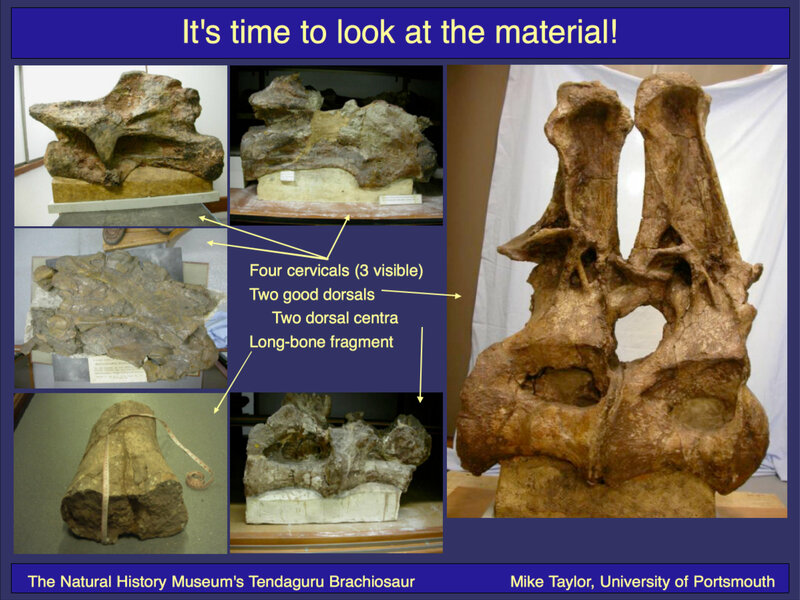 Of the skull no fragments have so far been identified, and this, the most interesting part of the body, as is so commonly the case with the dinosaurs, is lost. A large tooth was, however, found, measuring 6+1/2 inches in length with a maximum circumference of of 5+3/4 inches, which would indicate that the head was large. This tooth, which is pointed, has a slightly serrated inner edge. Two other teeth, small ones, were also found in different places. Their dissimilarity in size would not be unusual if this dinosaur were a theropod, a flesh-eater, for this type had teeth of varying sizes; but it is rather disconcerting in this case, the presumption being that the dinosaur was a sauropod, a vegetation-eater. It is therefore open to suspicion that the big tooth may be an intrusion. I have never come across these teeth during my adventures in the NHMUK collections; but then I admit I have never particularly paid attention to teeth. If you should happen across them, that would be great news. From Migeod’s description, you can see that even he himself found the assignment of the large tooth dubious, but seems to have accepted the two smaller teeth without question. But since the large one was most likely shed by a scavenging theropod, it doesn’t seem unlikely that the same may also have been true of the small ones. “Pointed, with a slightly serrated inner edge” is a rather perfunctory description of the tooth — does that sound to you like it could be that of a brachiosaur? Excellent, thanks Mike! I’ll contact the NHM and see if they have any knowledge of the teeth. The description potentially could be of a brachiosaur tooth – unworn teeth of Giraffatitan do have a pointed tip, and certainly smaller unworn ones I’ve seen do have denticles/serrations on one edge only. 6+1/2 inches is big even if it includes the roots though, and I don’t remember seeing the denticles on the largest teeth, though most are already fairly worn. In Giraffatitan there is also a pretty big size difference between e.g. the largest premaxillary teeth, and the smallest dentary and maxillary teeth from the rear of the jaw. And a smaller difference in shape from front to back toothrow positions, so without seeing them nothing in the description rules out the smaller ones belonging to the same individual. Mike, if you end up as an author on a tooth paper, I am going to mock you without end. I might be the author of a tooth paragraph one day, if I get enough help. But beyond that, I think you can rest easy. « How much poop did Argentinosaurus produce in a day?